This interpretation of the life of Hou Yuen-chia (first played by Yuen Yat-chor, then Leung Kar-yan in his later years) is a pleasing mix of pastiche and homage. His nationalist tendencies are thrashed out in trashy segments which lay waste to British, Russian and Japanese antagonists (all spirited and harmless fun), which recalls the patriotic stance of (historically) Wong Fei-hung and (thematically) Bruce Lee. 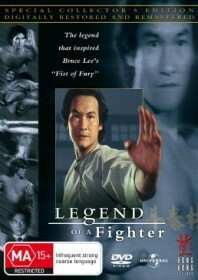 Hou is the poisoned sifu of whom Lee’s fictitious character avenges in Fist of Fury, but the film only shares parallels with Lee’s film in its sentiment and Leung’s strained facial expressions. Yuen Woo-ping’s comedic choreography is as full-on and exciting as you would expect, with Phillip Ko particularly special as Hou’s ageing father (defender of the Hou Fist) and Kurata is wickedly good as the clichéd Japanese karate fighter who must square off to Leung’s kung fu nobleman in the final reel. Of course there is very little in the way of subtlety – Hou is steadily reduced to pounding Chinese naysayers like Dragon Lee in a poor spin-off – but the high-quality cast and crew transform this effort into much more than just mere exploitation. In 2006, Woo-ping returned to the same subject as a fight choreographer for the film Fearless with Jet Li taking on the Hou Yuen-chia role.